I happily acknowledge a long-standing debt to Bonhoeffer. During my seminary days, in the midst of an overly smug orthodoxy, his writings motivated me to keep on with the theological quest. At a practical level, his forthright explications of “cheap grace” and “religionless Christianity” helped make sense of the church in today’s world. Most recently my gratitude to him has been kindled through a chance comment written by a friend in Uganda. He said that Bonhoeffer’s book on the Psalms was selling well in Christian bookstores there. I ordered it out of curiosity: What did these believers in such difficult circumstances find in this little, 86-page book? 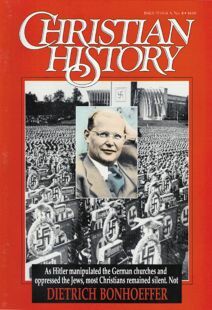 Bonhoeffer’s life was caught up in epochal events that have shaped our century. Nevertheless, his teaching, writing, and living inevitably seemed to come around to how we think, believe, and pray. As a filmmaker, for over twenty years I have tried, without success, to organize a feature film or television movie on the life of Bonhoeffer. All the elements are there for a captivating production that could speak the gospel uniquely to today’s world. Others, too, have tried in vain to mount such a dramatic film. It is still a worthy project, and may God enable the right producer to worthily accomplish that task. Don’t be surprised if, after reading this issue, you find yourself waking up playing the movie out in your imagination. It’s that compelling a story and one we long looked forward to publishing for you. Dr. Ken Curtis, Founder and Senior Editor of Christian History.